Reigning World 200M Champion Dafne Schippers is seriously considering a return to the heptathlon following her poor showing in the Prefontaine Classic in Eugene, Oregon yesterday where she could have only mustered up a disappointing fourth-place finish. The Dutchwoman stunned the world in Beijing two years ago to take the gold medal in a very impressive 21.63s which is the third fastest time in history and subsequently aroused suspicions of drug-use due to the fact that she is white and having only just started sprinting as a specialist the year before having previously competed as a heptathlete. "You know it's very disappointing. This is my worse performance in a sprint event since I finished fifth in the 100M final in Rio last year and my worse finish in the 200M since I started competing as a specialist sprinter. I must say well done on Tori Bowie's part. She ran a great race and is fully deserving of her victory. Also, to end Elaine Thompson's win streak this year is quite impressive. It's apparent that I definitely have my work cut out for me if I want to successfully defend my 200M World Title in London this summer." "I thought that by switching coaches I would have gotten better results. But apparently the opposite is true. I am now wondering if leaving Bart for Rana was a good idea seeing that my results on the track lately are somewhat disappointing. I was speaking to Rana last night after the race and I told him that it may be in my best interest if I make a return to the heptathlon. I don't want to feel that I am wasting my time in the sprints because to tell you the truth those Jamaican and African American girls are the hardest to beat. And of course, their being black means that they do already have a slight genetic advantage over me even before the race starts. If I am not at my best on race day and I get a bad start then I have to say good-bye to first place." "Rana told me that whatever I decide to do he is willing to go along with it. But with the World Championships only a few months away, I am not too sure if reverting to the heptathlon at this critical time would be in my best interest. 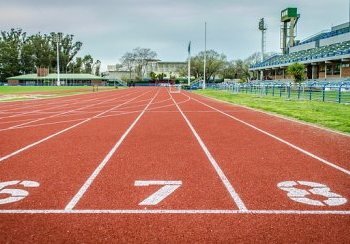 That said, with my now waning reputation in the sprints and having not won an individual race so far this year, I am now beginning to question whether the 100M and 200M individual sprints are the right events for me." i didn't not un-despise this. ooops, wrong post! If I give you some money, will you go away? :(. Now listen here you little dickwads... well, I laughed.